Bestselling Guidebook to Nepal & Bitcoin Cryptocurrency! The Bestselling Guidebook to Nepal & Bitcoin Cryptocurrency purchase options! by Dave from The Longest Way Home ~ February 14th, 2018. Published in: Travel blog » Nepal. My Nepal guidebook has outsold all the others … & is now available in Bitcoin! It made a good start to the new year when my publisher at Himalayan Travel Guides was tallying up their sales from the year. I knew we’d overtake everything for the third spot based on initial paperback sales in the first few weeks. Then, a month or so later, he let me know we’d taken the second spot. We were the number two national top selling guidebook to Nepal. It was a close call for far too long … then the message came. We’d taken the number one spot! 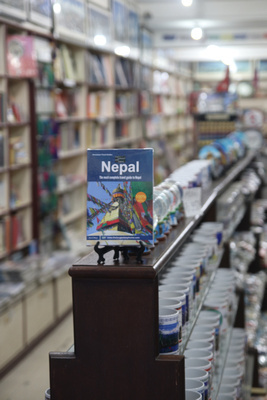 My print guidebook to Nepal was the best selling guidebook to the country. Moreover, now it’s doubling up and hitting up being a national bestseller over the other two … combined. When I first began publishing my guidebooks in 2014 they were digital. Not just any type of digital either. I didn’t want “just another” run of the mill type of guidebook or digital guidebook. I wanted to rebuild the travel guidebook and create a new type of offline travel guide that travelers could use just like a paper version. My digital guidebooks to Nepal did just that. They gave travelers an unbiased, honest, frank and practical way to explore Nepal like never before. They were/are also the first to be fully interactive, meaning they are very easy to navigate. Moreover, all the content is 100% original. I’ve written every bit of that content along with hitting every inch of road with my feet multiple times to make sure it was all correct. I filled in all the blanks other corporate guidebooks forgot about – how to write a guidebook for travelers who travel. I thought about Print On Demand. Publishing one’s own paper guidebook. I did the cost calculations. Then weighed up the standard of maps that POD could produce. It failed to be both financially viable no matter how many were sold and the maps were not clear enough for my liking. 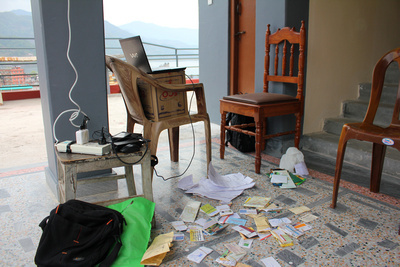 Then, Himalayan Travel Guides contacted me and made an offer to publish my book. The odds shifted. With an actual publisher, distribution was 50% complete as was the standard of print. You can read the full story of how my guidebook went from digital to print here. This meant a two-factor in terms of sales and mainstream acceptance of what has become the best guidebook to Nepal in the world today. When the paperback guidebook was published in July it wasn’t without difficulty. The link above on how it happened tells the full story above. What it doesn’t capture is that incredible feeling when you walk into a bookstore and A) see your book on a bookshelf. B) Know someone felt it was worthy of publishing it. C) When the sales rep behind the counter tells you that they already sold a copy! It’s then you know … well, I did it. A slightly different feeling to selling your first digital guidebook. A distinctive memory in its own right. But it’s cross referenced with a doubt. Then the next digital sales happens. Then the referral and then down the line the emails of thanks from customers who are delighted with the book – this is/was the clarification that ensures the first one wasn’t a fluke (not that it was). It was actually a culmination of everything coming together after going full circle. The paperbacks kept selling alongside the digital version. The orders came from bookshops and online. The former felt less pressured, more traditional and somehow more relevant for Nepal as a destination. Since 2014 I’ve only ever had one complaint about the digital guidebook. A gentleman from India complained he couldn’t read the trekking maps. He was most annoyed. It didn’t make sense to me. You could zoom right into them. The trekking trails could be seen up closer than another book in the world. What didn’t he see? It turns out he was not pinching and zooming on the map … he’d never owned a tablet before. He was more than happy to discover what it could do. Everest Base Camp Map from my digital guidebook showing the Khumbu area – yes, you can pinch and zoom right in! For the paper version there was a risk with the same. But the maps came out well. Moreover, we created the first and only guidebook in history with duel maps. My own GPS coordinated maps and the publishers award winning Great Himalayan Trail maps. The combination offers trekkers and travelers the best of both worlds. Again, no complaints. I’m guessing someone will probably send one in now. But it’s too late for trolling. We beat them too. Emails from people ordering from all over the world started to come in. Mainly the USA, Europe, Asia and Australia. The middle-east is an issue due to postage. South America is a linguistic and economic barrier. Africa has sales with South Africa doing very well but hampered again by an ineffectual local postage service. It’s this physical aspect that has been the biggest headache. Just this year the Nepali post office shut its doors for a few weeks. It’s open again now. But these are the behind the scenes issues that make print so much more “difficult”. For the best of both worlds the digital / paper guidebook combination offer became a very popular option. A common question is why the guidebook is not for sale on Amazon. The answer is simple. We’d have to spend above the ROI posting the books out to various international Amazon distribution warehouses. This would drive the price of the book up twofold. 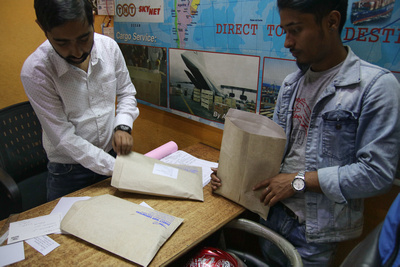 Who needs Amazon when you have a great local team like Direct Way Exporters sending out international book shipments! The alternative (which Amazon wants) is for us to publish a version of the guidebook through their own printers. The issue there is that after Amazon takes their percentage of the profit we’d end up losing money for every sale – the guidebook is nearly 600 pages. Moreover, the standard of paper they use means it would not be durable enough in my opinion for travelers in Nepal. Plus, maps… My maps are good, very good. Amazon’s printing is not so detailed for them to shine through like they do now. The Amazon option is still open. I’m working on it with them. Publishing and distribution changes every month. I am certainly not ruling it out should an agreement be made that is financially viable and meets travelers needs. There are options, but publishing at this scale is not a profitable business so everything needs to be weighed up. Lastly, let’s not forget that beside giving travelers the best guidebook to Nepal we also published the book to help create local employment in Nepal. The book is 100% published and printed in Nepal by Nepali people. This alone puts it a grade above all other guidebooks to the country. Once you have your own book in print the first thing you tend to do is become your own worst critic. At least I do. There’s much more I want to do with it. Nepal is constantly changing. Everything on this website is updated as it happens or is necessary. Likewise with the digital guidebooks. Sure one could hire a PR company. Push it to the moon with Amazon. Or even hang up ones pen for a while. I prefer to push the boundaries a little more though. When news came in that my guidebook was now the national best selling guidebook to Nepal I did not think of money. If you are a publisher or writer then you’ll know there is no big money in publishing non-fiction like this. All I thought about is … history is made. We did it. Now, let’s make it better. All my guidebooks to Nepal are now available to purchase with any major credit card, PayPal and now Bitcoin or any ALT cryptocurrency! My guidebook to Nepal can by purchased with Litecoin, Dash, BitcoinCash or indeed Bitcoin. Take your pick … (personally I’d go with Litecoin or DASH for lower fees). The future. Bitcoin and cryptocurrencies are like digital cash in the form of blockchains. Much like gold, silver, paper notes or coins, cryptocurrencies come in all shapes, sizes and with slightly different purposes. Bitcoin is perhaps the best known and is currently a bit overloaded! Hence the transaction fees are high at the moment. That will all change as the code behind it is being upgraded the lightning network. That, or it’s going to become a digital asset like gold and all other digital currencies can then be measured from it. Meanwhile, the likes of Litecoin offer faster transactions at much lower costs. A famous analogy is Litecoin is the silver to Bitcoins gold. Perhaps a better one is, Litecoin is like Bitcoin – but a lot easier! I believe that cryptocurrency is part of the future, just like this guidebook. So, we’ve integrated it. Why? Well cryptocurrency like Litecoin or Ethereum allows direct secure international transfer of currency very quickly and securely. There’s no need for banking, credit card or currency fees. There’s no need for currency transaction fees either. So, the immediate benefit to you is a cheaper book. Yes, buying my guidebook to Nepal with the likes of Litecoin means I can lower the price! Bitcoin and the ALTs (alternative cryptocurrencies) are constantly developing. But the potential is huge. I’m glad to be the first to offer a guidebook using it. There’s a different page and checkout for cryptocurrencies than with credit cards or PayPal. I want to offer people more than just “Bitcoin” so digital currencies like Litecoin, DASH or Ethereum are used more for day to day transactions as they are faster and cheaper. I’ve been working with several developers from various cryptocurrencies who are creating new purchase processes for customers who use the likes of Bitcoin or ALT currencies. I could just lump them all in with a generic shopping cart. But, just like the book I want the people and communities that have helped support cryptocurrencies to also benefit from creating new ecommerce options. A shout out to the Litecoin developers who are currently working on LitePay and LitePal. Also to those within the Stellar group doing similar things. It’s exciting times! For now, if you prefer to pay for a book with a cryptocurrency, I’ve selected a very stable and straight forward system. If there’s any cryptocurrency not listed that you want to pay with, feel free to contact me. Meanwhile secure credit card and PayPal purchase options are still available and remain the same as they always have been. Here’s the main Nepal travel guidebook page with all the payment options listed at the bottom right. I’m delighted in the accomplishments this book is making. We live in a world whereby it’s not just about being in print. It’s about pushing boundaries, reaching people in all corners of the globe and breaking the rules of tradition in a good way. We’ve upset the status quo. I’ve been told not to do it. That this will never work. It’s a waste of money. It’s a waste of time. I’ve proven them all wrong. It’s been a part of the journey that built this website. One we’ve all been apart of together. You’ve witnesses and been a part it too. To those who read and wonder about their own lives. Have a dream. If it’s pure of thought, ignore the neigh-sayers. Put your all into it and prove them wrong. You’ll do something that will become a legacy. A game changer in the world. There’s no better feeling. It’s been a great accomplishment not only making history on several occasions with this book but in having it become the best selling guidebook to Nepal. Perhaps the best overall thing about this book is that the readers and travelers to Nepal who use it are finding it to be the best guidebook for Nepal. Their holidays, trips of a life time and great adventures have been made better with it. So there you go. Sometimes, you just gotta shout it out. Heading to Nepal this year? 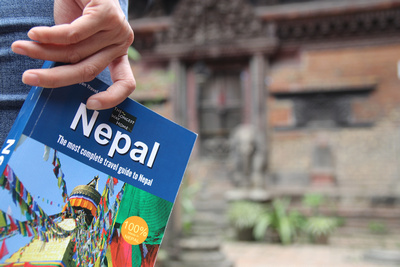 Make the right choice and get the insiders advantage with the best guidebooks to Nepal. The most up-to-date, popular and dedicated guidebook to Nepal in the world. Take a look below and you’ll find out why! A double thumbs up! Small businesses are taking things back to where they should be … on top of the world!! Another long term reader here. Watching as the story keeps getting better. Well done mate. Long time reader who has been to Nepal on several occasions. I’ve just made a purchase of your digital guide – (normal money) I don’t quite get Bitcon. Your website has made my trips to Nepal so much more interesting and enjoyable. Thank you for that alone. Looking forward to reading the book. Thanks for making a purchase Darnell! Great to hear you’ve found the website a help for your trips to Nepal. I hope the book makes it an even better experience! Well done. This is great news for you and small publishers everywhere. So interesting to read about Amazon here. Bitcoin too! Yes, there’s more to it than simply “listing” a book on Amazon. The book has got to get to distribution warehouses first. Unless it’s printed by Amazon as I wrote above. At the moment the book is printed in Nepal which is giving employment to local people etc. A national bestseller is a great accomplishment. Keep going, as a silent reader here for years I’m looking forward to the day it’s an international bestseller! Ha, let’s see about that “international best seller” bit! Great work. I really am curious about Bitcoin. It’s in all the news and now I understand that you can make payments with it online too. Thanks for bringing me this snippet of news as I feel like I’m getting it now! Yes, Bitcoin can be used online as a digital currency. It’s been a round a while but the technology is really just taking off when it comes to paying for things online. There are others too, which offer different things like more speed, cheaper transactions etc. Well done!! Awesome news. Great to see something like this happen. Hard work pays off. Thank you. It’s not as easy as it may seem to many. But, it’s set a few milestones which is great. Where’s NANO? Ha ha. It’s great to see crypto entering the mainstream like this! Once merchants start to list more cryptocurrencies then more will be listed! At the moment, most are sticking to the mainstays. Congratulations! I know print doesn’t pay, but well done anyway! Ha ha, yes print doesn’t pay well at all after when you take into account the costs involved! Just bought your guide (digital version.) Looks impressive. Btw, I have been using my Paypal the whole 7 months I have been here with no problem. I still am using the same computer I brought. I don’t know what will happen if I get a new computer. Also, all my Paypal transactions have been from/to USA people, where I am from. I haven’t tried to send money out via Paypal. I think one reason that Paypal is not welcome is that Nepal doesn’t want money to leave the country. Are they the only country you know of where it is illegal to take money out of the country, and, thus, able to change NPR for other currency outside the country? Also, the people I have talked to seem to think that no matter how much money you bring into the country, you will never be allowed to take out more than $2000 when you leave. I plan to open a local bank account soon, which I will need to get a student VISA. Also, that should mean no more problems finding an ATM that works today. I have had excellent results at a Bank ATM lounge next to the east entrance of Durbur Square (New Road). ATM results here in Patan can be very spotty. Withdrawing money from Nepal is not allowed either through PayPal, bank accounts or Western Union etc. This is where PayPal withdrawing from bank accounts does not happen. Depositing, is possible. However, you would need to call / email PayPal as they monitor IP addresses and transactions. I would not take a lot of Nepali or foreign cash out of Nepal. Certainly don’t leave with more than you came in with! Yes, a local bank account will help with finding a working ATM. Patan can be patchy. Usually the issue is satellite connections. Thamel or a main branch bank is best. Likewise if there is loadshedding, it’s best to stay clear of ATMS for a few hours.